Dos Pueblos is Spanish for two villages, but to locals, that’s the name of our high school. And the name of a ranch on the outskirts of town. But why would this ranch and our high school be named “Two Villages”? Good question…. This aerial shot from 1936 shows where the two separate villages were located. We emphasize separate because they were very different and unique. There was just a small stream and an estero between them, but despite their proximity, they spoke different dialects and had different cultures. The villagers were not allowed to cross the creek without first getting the other tribes’ permission. The people of the two villages also had different physical characteristics. The people of Mikiw were thought to be descended from the Shoshone tribe, those people being tall, slender and a light complexion. The Kuyamuns were thought to be from Aztec descent, short, thick and darker skinned. It’s not known which group was there first, which group was more aggressive, and how they came to tolerate each other. We only know that they lived next to each other for hundreds of years. In the exposed cliffs below Kuyamu was a trickling stream of asphaltum, a great asset to that tribe. It was used for a multitude of things by all the Chumash villages,including the construction of their impressive watercraft, the Tomol. Their houses were described by European explorers as a half an orange covered with skins. They arranged them in groups and each house slept multiple families, with interior walls to divide the spaces. Some huts housed 50 people! Interior light came from a hole in the roof that also served as a chimney. Unlike most early Californians, the Chumash slept in framed beds raised off the ground and they covered themselves with skins and shawls. While we like to imagine the Chumash as living in a perfect world, the reality was not so idyllic. Being human, they surely had their problems too. Social inequality was apparent, as there was an upper class, middle class and lower class, distinguished by their apparel. Additionally, many Chumash villages had ongoing disputes with some of their neighbors. Spanish journals from the 1770s mention the near constant fighting of some tribes, the most common disputes being about trespassing and women. The normal method of warfare was by ambush or late night attacks. The Chumash living at the Dos Pueblos were reportedly seen as “troublemakers” and some witnesses described seeing them with scalps from other Chumash they had killed. The villages at Dos Pueblos were also victims of raids and one report says the attackers came from inland specifically to attack Kuyamu. The Arroyo Quemada area, just up the coast from Dos Pueblos, is named after a village that was burned while the inhabitants slept. According to the journal of a Spanish Governor, the natives from Dos Pueblos were responsible. The same journal states that the Dos Pueblos and the village on Mescaltitlan island were “declared enemies”, that fought viciously and often. So often, in fact, that the Spanish considered putting the Presidio in between those two villages, instead of in Santa Barbara, to prevent the constant fighting. Many other tribes got along well with one another and trading was commonplace between them. There were alliances with villages from different areas up and down the coast and deep in the inland valleys. When the Europeans appeared in the Santa Barbara Channel, they were more than welcomed by the natives. Their friendliness towards the explorers was overwhelming. Were they just a naturally happy people, eager to share their paradise with strangers? Or were they hoping for a powerful new ally in their ongoing battles with rival tribes? Most modern California history books start with Juan Rodriguez Cabrillo cruising up the California coast under the Spanish flag. In fact, Walker Tompkins calls the day Cabrillo anchored off the Dos Pueblos, the day history began. But for the Chumash, it was really the beginning of the end. Cabrillo’s two ships, La Victoria and San Salvador, dropped anchor off Dos Pueblos in the late afternoon on October 16th, 1542. The ships must have been an awesome sight to the natives, but they probably heard of their approach from fellow Chumash to the south. 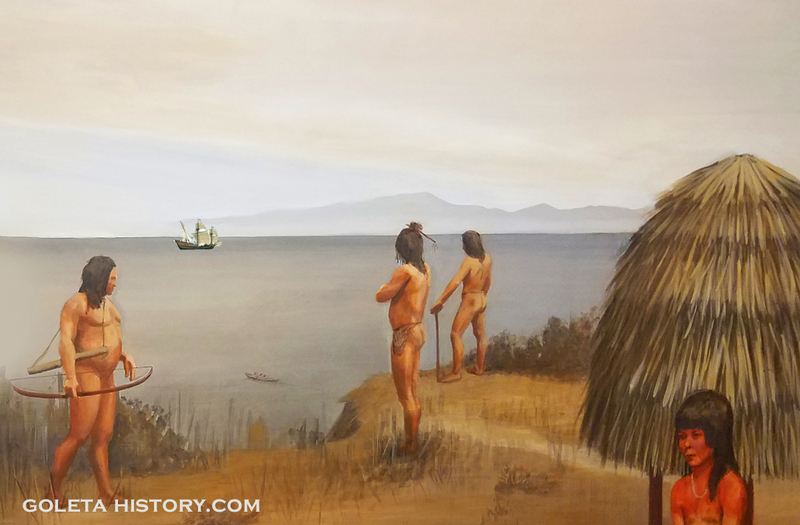 Cabrillo had seen and visited many native villages on his six month journey up the coast, and he knew if he let his men go ashore, the Chumash hospitality would put them further behind schedule. His purpose for stopping here was just an overnight anchorage before resuming his search for the mythical Northwest Passage. The entry in Cabrillo’s log this night read, “anchored in the evening opposite dos pueblos”. And so it was, the generic name was born. Cabrillo and his men watched as the friendly Dos Pueblans paddled their tomols out through the surf to greet them. They had seen this for the past week, as they had been escorted by the Chumash on these speedy canoes all through the Santa Barbara Channel. They were loaded with gifts of fresh and dried fish, baskets of acorn meal and so on. The Europeans usually reciprocated with glass beads from Italy, brightly colored cloth scraps and other worthless trinkets. But this day Cabrillo was under the pressure of winter approaching and supplies dwindling, so he had to refuse the natives invitation to come ashore. At the crack of dawn, Cabrillo was off, across the channel to check out the islands, and to meet his fate. (Historians can’t agree on the details of Cabrillo’s death, so we’ll go with Walker Tompkins version.) On his first visit to San Miguel Island, Cabrillo broke his leg. They continued on, around Point Conception, where they encountered rough seas and foul weather. The expedition made it as far as the Rogue River in Oregon, but retreated back to the Santa Barbara Channel for refuge. Gangrene had taken hold of Cabrillo’s battered body, and when they made camp on one of the Channel Islands he passed away, just a few months after his visit to the dos pueblos. Many believe he is buried on San Miguel Island, in plain view of the villages at dos pueblos. The people of Mikiw and Kuyamu went back to life as usual after the strange visitors left, and their memory slowly faded. Amazingly, 227 years passed before another European made direct contact with their world. Generations were born and died with the legend of the hairy jawed white men on giant canoes. A few large ships passed by over the years, but they stayed well off the coast and probably were not noticed by many. Imagine those few telling others what they think they saw and being met by skepticism, much like a UFO sighting today… The mid 1700s brought invaders from another corner of the world. Russia had claimed Alaska, and they quickly realized the value of the sea otter pelt. Aggressive Russians enlisted Aleutian slaves to help harvest the pelts and they were soon seen hunting in California waters. This handsome gentleman, King Charles III of Spain, did not like having Russian operatives off the coast of his Northern Mexican provinces. He decreed that Alta California needed armed defenders, ASAP. Spain came up with a three pronged plan; Presidios, Missions, Land Grants. Thus, a land expedition was put together to determine locations for the presidios and hopefully find a good harbor for the Spanish Navy. A Catalan soldier, Don Gaspar de Portola, was put in charge of the expedition that left San Diego in July of 1769. His group consisted of chief scout and trailblazer Sgt. José Francisco de Ortega, Father Juan Crespí, many soldiers and Baja California natives and 100 mules carrying supplies. There were 63 people in all. In the late afternoon on August 21st, 1769, the group came through the oak groves to Dos Pueblos Creek where they stopped to water the livestock. The scout, Sgt. Ortega, was the first European to set foot on the soil at Dos Pueblos, and he greeted the awestruck people of Mikiw and Kuyamu. These Chumash were the great-great-grandchildren of the Chumash that welcomed Cabrillo two centuries before. The Chumash were especially amazed by the great beasts these fancy men sat upon. Horses had never trod upon Dos Pueblos before, but they would play a huge role in its future, as would young Sgt. Ortega… Fr. Crespi kept a daily log and he described an Indian settlement of more than 1,000 souls. Crespi officially named the dos pueblos, “San Luis Obispo de Tolusa”, but it didn’t stick. The explorers camped near Kuyamu and were immediately greeted with gifts of fresh fish. They had been welcomed at most every village since Malibu and were growing weary of the all night parties. Fr. Crespi described how the Chumash at Dos Pueblos were not satisfied with providing the visitors with fresh fish but also wanted to entertain them. The chief came with split reeds that when shook served as a rhythm instrument to accompany their chants and dances, all through the night. The Europeans begged the Chumash to let them sleep, and sent them away, but they returned later in the night blowing some sort of horn that Crespi says, “was sufficient to rip our eardrums to pieces.” The soldiers feared the horses might stampede and they quickly gave the Chumash some beads and convinced them to let them sleep. The next morning, Portola got a good look at the area surrounding Dos Pueblos, and was so impressed that he ordered the expedition to stay some extra days to make a detailed survey. This lead many to believe this site was seriously considered for the location of the Presidio and Mission. Additionally, this allowed the expedition time to learn more about the Canalino Chumash. A lot of valuable information was recorded at Dos Pueblos. They studied their huts, sweat lodges, cemeteries, stone and basketwork, their tomols and they tried to learn about their society. Among their observations, they determined monogamy was the norm, crime was so rare they had no punishment system, and they had a money system using limpet shells. They recorded random little observations like how women played a game similar to throwing dice, using snail shells filled with tar. The number of shells landing upright when a handful was tossed determined the winner. They also reported that sexuality held no moral constraints, so promiscuity with the disease ridden explorers was accepted. Unfortunately, this would help facilitate the demise of their population. Portola’s group moved on and a few years later, in 1774, Juan Bautista de Anza and his expedition camped at Dos Pueblos. The Chumash probably began to realize these foreigners were not going away. In 1782, the Spaniards built a Presidio near Chief Yanonalit’s village in Santa Barbara and the commandante was Jose Francisco de Ortega, the scout from Portola’s expedition and a friend of the Dos Pueblos Chumash. A permanent Spanish military base didn’t have an immediate effect on the natives, but four short years later the mission was built, and that’s when things really went downhill for the Chumash. Father Fermin de Lasuen constructed, with Chumash labor, a small adobe church near the Royal Presidio and was ready to start saving souls. Father Lasuen visited all the Chumash villages in the area, including the dos pueblos, where he informed the villagers that they were now living on a Royal Rancho, granted to the Mission by the King of Spain. They would now be expected to cultivate their land, plant, farm and harvest crops, to help support the cause of the Mission. To people that had lived off the bounty of Mother Nature for centuries, this must have seemed absurd. But they didn’t have much choice in the matter. Even more ridiculous was the order that they must leave their comfortable home at beautiful Dos Pueblos and go live in tiny windowless adobe huts inside a locked gate at the Mission! Some of the elder Chumash rebelled at this nonsense and wandered back to Dos Pueblos, but the Fathers were determined crusaders. They fervently believed they had to save these pagan souls, even against their will. In 1769 Portola reported thousands living at Dos Pueblos. Just 25 years later, a census counted 210 people living there. Most residents had been forced to move to the mission and work for the padres and soldiers, or they had died from European diseases. Salsipueto was the chief of the rugged few that chose to stay at Dos Pueblos and refused to suffer the foolish ways of the Spanish lifestyle. The final blow came for the villagers at Dos Pueblos as a result of a Chumash revolt in 1824. Mission neophytes, fed up with the abuse, briefly fought back against the Spaniards, then quickly retreated to the mountains. Four elders from Dos Pueblos happened to be walking down to visit Santa Barbara the same day, oblivious to the warfare. When they arrived into town, Spanish soldiers brutally beat and disemboweled them in the street, in front of multiple witnesses, simply for being Chumash. The news of this attack sent most of the few remaining at Dos Pueblos packing into the mountains, as far as Tulare county, never to return to their ancestral home. In 1837, a young Irishman named Nicholas Den rode through Dos Pueblos and fell in love with the area. He vowed to own it one day, and went to work for the Ortega family at Refugio, supervising Chumash laborers. Den had studied medicine in Ireland, but never got his diploma. Since there were no doctors in Santa Barbara at the time, he became very much in demand as a doctor. He helped all walks of life and took pay only when they could afford it. He saved a lot of Chumash lives and befriended many of them. He soon learned to speak Chumash, and they taught him about their medicinal herbs, which he put to good use. After much hard work and jumping through all the political hoops, Den was awarded the Rancho Dos Pueblos land grant in 1842. He considered himself a friend of the natives, and he allowed some Chumash to live on their ancestral lands at Dos Pueblos. Den lived a good long life here and his last action on this planet was to save a Chumash life. He left his sick bed in the middle of a cold stormy night to assist a Chumash woman giving birth at El Capitan Point. After he managed to save the woman’s life, he journeyed back home through the storm. The next morning, Den died from double pneumonia. His Chumash friends and employees assembled outside his window and sang an ancient sacred chant, reserved for the passing of a high chief. The Dos Pueblos Ranch changed hands through the following years and several prominent archaeologists came and studied the Chumash remains. Much of the village site of Kuyamu has fallen into the sea due to normal erosion, and famed archaeologist David Banks Rogers happened to be working on this site when the Great earthquake of 1925 hit. He describes watching a large portion of the village site dropping into the sea, all at once. Another archeologist, Dr. Yarrow working in 1875, took 10 to 15 tons of artifacts from this area. He reported arched whale bones above the graves at Mikiw. Some thirty skeletons were buried on the bluff in beach sand. Archeologists were baffled by the reasoning to carry about 5 tons of sand up the 60 foot bluff for burial rites. Further up the canyon they found remnants of a village of the Oak Grove people, an ancient people that were here thousands of years before even the Chumash arrived. This place we call Dos Pueblos has been desirable for eons…. And continues to be so today. If you have enough money, this sacred place can be rented to celebrate your own special occasion. So, if you’re ever lucky enough to find yourself there, take a moment to imagine how it once was, and the people that lived there for centuries before us. Thanks for another great history. What a fantastic read! Thank you for putting this together, very interesting and informative. A traveler from Orange County. This was a fascinating read, Tom. In particular, I’d never heard the name Nicholas Den. His story sounds very interesting. Are there any places named after him? This history was very interesting. I am a docent and was under the impression the Chumash were entirely peaceful and did not fight among themselves. Turns out there were two groups who did not always get along. Sorry to find out I was wrong and will have to modify my talks to visitors. Yeah, it was an eye opener for me as well. I’ve always imaged them as living a Garden of Eden type perfect life, but as I researched, I realized humans are only human. No matter when and where they lived.